Paperwork and bureaucracy is reducing UK nurses' ability to devote quality time to their key role of caring for patients according to a recent statement from the Royal College of Nursing (RCN). On 21 April 2013 an ICM survey for the RCN revealed that nurses are being prevented from caring for their patients because they are drowning in a sea of paperwork. According to the survey, the increasing burden of administration work expected of nurses has resulted in them spending an estimated 2.5 million hours a week on non-essential paperwork and clerical tasks. That is more than double the 2008 figure. This amounts to an average of 17.3% of all the hours worked by NHS nurses in the UK . 86% of the 6,387 nurses who responded to the survey said the amount of non-essential paperwork such as filing, photocopying and ordering supplies had increased in the last two years. 55% of nurses who responded to the survey said that the burden of such paperwork had increased dramatically. 81% of nurses working in every setting surveyed said that having to complete non-essential paperwork prevented them from providing direct patient care. 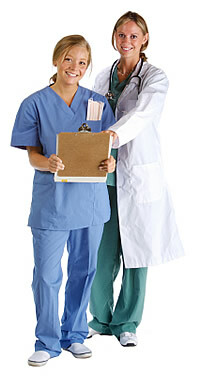 27% of nurses who responded to the survey said their workplace doesn't have a ward clerk or administrative assistant who helps with clerical duties, and of those 81% thought having a ward clerk or administrative assistant would mean they would be able to spend more time providing direct patient care. 61% of their colleagues who did have help confirmed that having a ward clerk or administrative assistant meant they spend more direct time with patients.
" These figures prove what a shocking amount of a nurse's time is being wasted on unnecessary paperwork and bureaucracy. Yes, some paperwork is essential and nurses will continue to do this, but patients want their nurses by their bedside, not ticking boxes. _ We are encouraged that the Government has acknowledged this issue, and the ongoing review by the NHS Confederation is a step in the right direction, but urgent action is needed now." The survey also found that if technology is not used properly it can actually increase the workload of nursing staff. 26% of nurses who responded to the survey said that Information Technology is not appropriate for the job they need to do. Further, members have told the RCN that when technology isn't implemented properly, it can actually double the amount of paperwork for each patient. This is a particular problem for those nurses working in the community, such as district nurses.
" Technology was introduced into the NHS with the best intentions, but when it takes a nurse double the amount of time to complete a paper form and then type it up on a computer, you know something has gone very wrong indeed. We need a smart, efficient and IT savvy NHS, not a halfway house that actually impedes the work of staff and takes them away from patients". News is included on the IvyRose website to inform visitors about current health issues, but not to endorse any particular view or activity. Any views expressed in the article above are not necessarily those of IvyRose Ltd.. Material in this news item was released by the Royal College of Nursing (RCN) on 25 April 2013 and may have been edited (e.g. in style, length, and/or for ease of understanding by our international readers) for inclusion here. For further information, please visit their website.